She can also file an application for bail. 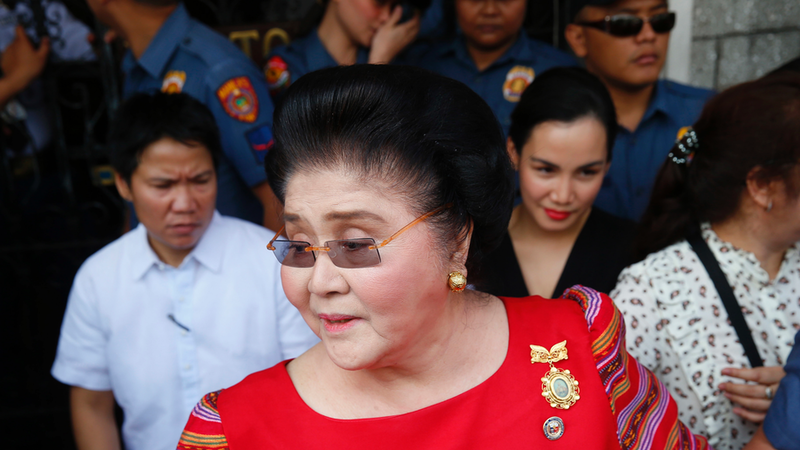 Former First Lady and incumbent Ilocos Norte 2nd District Rep. Imelda Marcos was handed a guilty verdict by the Sandiganbayan Fifth Division Friday morning due to her financial interests in several foundations created in Switzerland during the Marcos administration. The Sandiganbayan, the Philippines' specialist anti-corruption court, ordered that Marcos, 89, be arrested after sentencing her to at least 42 years in prison for hiding stolen public money in several Swiss foundations in the 1970s. Under the rules of the Sandiganbayan, the former first lady has 15 days from promulgation of the ruling to file an appeal, and the anti-graft court has 30 days within which to decide on it. Marcos may also go straight to Supreme Court to seek relief. Imelda Marcos in particular was known for her flaunting her opulent lifestyle while the country languished in poverty and civil unrest. After they left, Marcos's collection of 1,100 shoes was put on display in the presidential palace to show people the extent of the riches she had accumulated while in office.